When you think about all of the options for window treatments on the market, there are three main categories to choose from. There are readi-made curtains and drapery purchased at retail, custom made window treatments contracted through a design professional, or there is a “do-it-yourself” option. Let’s look at how they differ and see what might be best for your decorating project. Readi-made curtains and valances tend to be much less expensive than custom-made but your choices are limited, especially when you want to coordinate patterns and specific colors. Also, the sizing is never perfect. You often compromise fabric fullness or proper length to make it work. Custom made drapery usually involves expert workmanship using high-end fabric. Each window is designed by a professional who coordinates each project including the design, fabric and installation. It can be very costly and is often not an option for the average consumer. DIY (do-it-yourself) window treatments are a great option for most people. Its fun to get involved in making your own window treatments and you can save a lot of money in the process. Even if you don’t have any talent sewing, there are products that can get you the results you are looking for with little effort. You can often create the look of custom made styles and you can design them to fit your individual window dimensions. Here are some simple DIY window treatment ideas and products that make it easy. One of my favorite items is fabric glue and it is available in just about any craft store or on line. With fabric glue, you can make a seam, rod pocket or hem in minutes. You just run a bead of glue instead of stitching the fabric with a sewing machine. It is also great for applying trims. You can save a lot of money by customizing ready-made products. By adding a unique trim to shades, valances, even full length panels, an ordinary ready-made style can look custom designed. It’s all in the details. Fusible tape also makes do-it-yourself projects quick and easy. It fuses fabric together with the application of heat. You simply apply the tape where you want to adhere fabric or trim, and iron it to fuse the materials together. There are also do-it-yourself products that come as kits and all you do is supply the fabric. Some examples of this are roller shade and accessory kits, like fabric covered lamp shades. By using these products, you can easily custom coordinate your room using fabric. 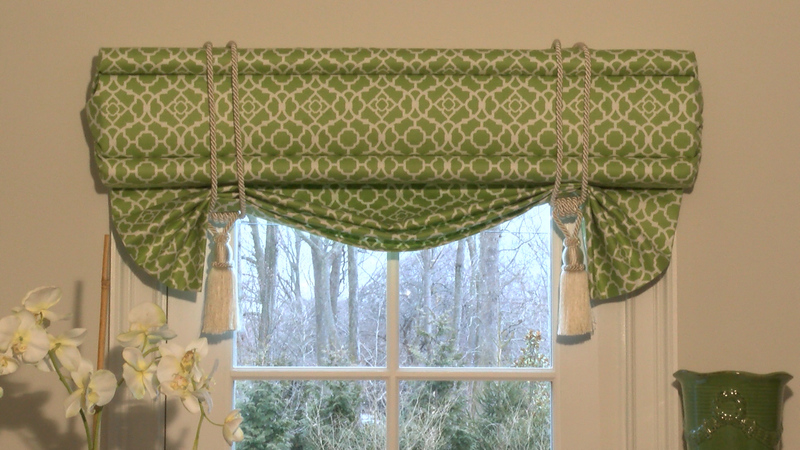 The Deco Wrap no-sew cornice kit is a simple way to get a customized look. All you need is two yards of fabric for basic styles, and very little time. You get two 40″ forms to cover up to 80″ of windows. You simply wrap and tuck the fabric into the semi-soft cornice forms. There is no sewing or glue involved. Basically, if you can tuck in your shirt, you can decorate your windows. These are a few DIY window treatment ideas to get you thinking. It’s a great choice for achieving professional results on a budget. Please share your tips and designs with us too, we would love to hear from you.